Icy Waters Ltd. is committed to the long-term social, economic and environmental sustainability of the Whitehorse area and the health of the local resources on which it depends. We take all the necessary steps to ensure the health of our farm and its surrounding area. Diligent husbandry techniques; adjustments to feed formulations; sizeable research on local ecosystems and wetland remediation; as well as regular monitoring and sampling of inlet, outlet and surrounding water bodies are just some of the ways we ensure our use of natural resources is sustainable. Using scientific methodology and protocols derived from the Canadian Council of Ministers of the Environment (CCME), we continue to manage our resources with great respect and appreciation for the uniqueness of this shared watershed. Icy Waters Ltd. is a land based aquaculture facility. We have a gravity fed flow-through design using streams and springs as our source waters. We utilize settling ponds and wetlands to remove particulate matter and effluent before returning the water to the natural wetlands downstream of our facility. On many occasions throughout the year, due to natural erosion, sediment enters our farm in higher levels than what we are allowed to discharge, and as such we act like a large filter on our watershed system. Due to the actions of our biological filters, we are able to effectively and efficiently polish the water prior to discharge. 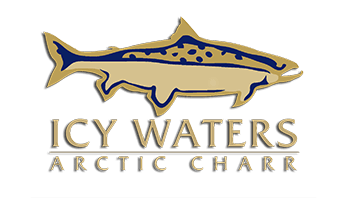 Icy Waters Ltd. is Ocean Wise™ approved and on the “Best Choice” list on Monterey Bay Aquarium’s Seafood Watch™. Icy Waters Ltd. consistently works to reduce our ecological footprint. Waste sludge from our treatment facilities is provided free of charge to terrestrial farmers for use on crops, while “leftovers” from processing are provided to pet food manufacturers, various animal habitats and dog mushers as a high-oil food or delivered to local compost facilities. This contributes to Icy Waters' effort to be a zero-waste facility.